For this remedy you need to use milk with higher fat content. Take two tablespoon of milk and add a tablespoon of honey to it. Apply this mixture on the skin and massage gently. This will allow the skin to hold in moisture. Alternatively you can soak your fingers in warm milk for 10-15 minutes daily and then wash it off with normal water. Make a mixture of pulp of a ripe banana and add some sour cream, a pinch of powdered sugar and a tablespoon of olive oil. Mix them well and apply on affected areas.This is an excellent natural remedy for treating peeling skin. Apply grated cucumber over the affected areas for 15-20 minutes.Cucumber has been found to be very effective especially for the skin on the face. Regular application prevents dryness of the skin. Apply the juice of fresh mint every night on affected areas of the skin.This is also considered good to cure peeling skin and also prevents prevent dryness. Make a mixture by mixing one cup of apple cider vinegar and two quarters of water and soak your fingers in this solution for 10-15 minutes. Wipe your hands dry and then apply a little lavender oil on affected areas. This home remedy is also considered good for dry peeling skin. To treat peeling skin you can simply apply the aloe vera gel on the affected area. The soothing and cooling properties help to reduce inflammation as well as cure the problem of peeling skin. Olive oil is known to contain omega 3 and other essential fatty acids that are beneficial for the skin as well as the whole system. You can apply olive oil on affected area and gently massage for 3-5 minutes and then leave for 15-20 minutes. Applying almond oil to the affected area will give quick relief. For best results massage the affected areas at least twice a day. Vitamin E oil is also considered very effective to prevent skin dryness and flaking. Break a vitamin E capsule and apply the liquid onto the peeling skin. Vitamin E is essential for healthy skin. In case the area is too large, try a lotion with vitamin-E as the primary ingredient and gently massage the area to cure the problem of peeling skin. 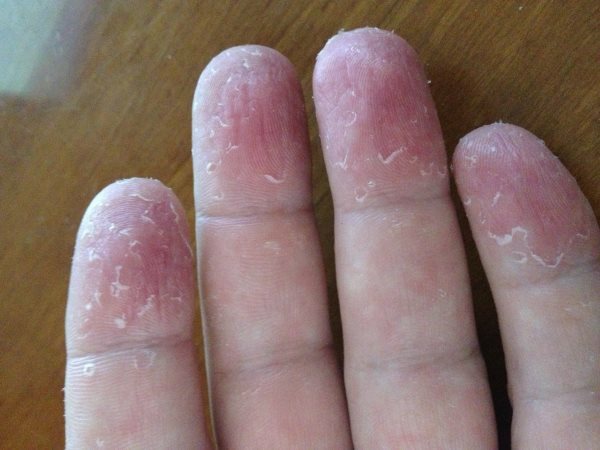 Sometimes peeling skin is caused by deficiency of Vitamin A, B and Iron. So Try to increase intake of food containing Vitamin A, B and iron.Good sources of Vitamin A are dark green and yellow vegetables and yellow fruits, such as broccoli spinach, turnip greens, carrots, squash, sweet potatoes, pumpkin, cantaloupe, and apricots, and in animal sources such as liver, milk, butter, cheese, and whole eggs.Good Sources of Vitamin B are meat, liver, eggs,yeast, unpolished cereal grains, cheese and milk.Good Sources of Iron include red meat, almonds,kidney beans, peas, baked beans, broccoli, raisins and rice. You should also increase the intake of Vitamin C in your diet because it prevents the skin from infections, increase skin`s elasticity, prevent wrinkles and boosts growth of new skin cells.Important sources of Vitamin C are oranges, tangerines, limes, guava, lemons, papayas, strawberries, black currants, grapefruit and mangoes. Many vegetables contain Vitamin C including collard greens, green and red peppers, broccoli, tomatoes, brussel sprouts, cabbage, potatoes, kale, spinach(palak), and watercress. Try to drink lots of water and daily drink at least 10 - 12 glasses.Water not only keeps your skin hydrated but also helps to flush out toxins from body and prevents from further dryness. (i)Never scratch the peeling skin even if it itches or hurts. (ii)Do not wash your hands with a strong soap. Try to use mild beauty soaps. (iii)Avoid hot bath because it remove moisturizer and natural oils from skin. (iv)Apply good sunscreen lotion before going out in the sun to protect your skin from harsh and harmful UV Sun rays. (v) If the problem get worse, even after following above remedies, then you should consult your problem with a good dermatologist (skin specialist doctor).